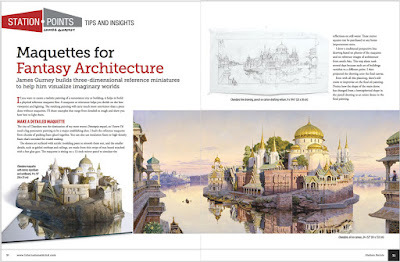 Gurney Journey: Why Make Analog Architectural Maquettes? 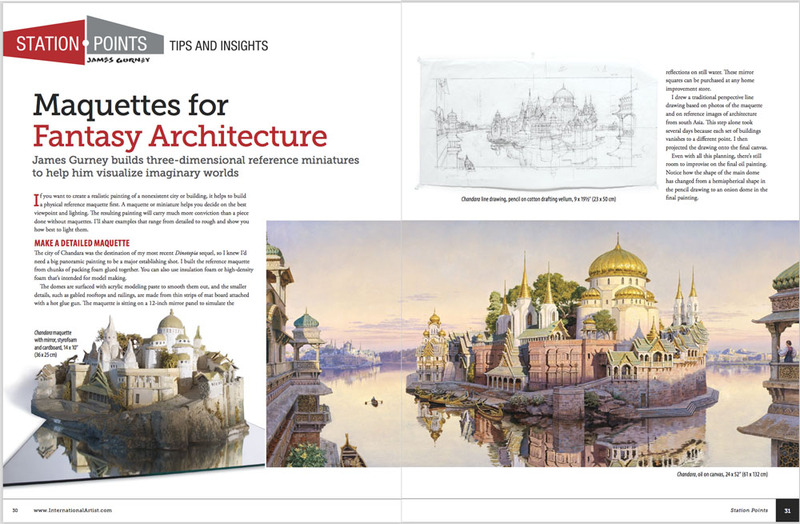 For the upcoming issue of International Artist Magazine, I wrote an article about making architectural maquettes for reference. They can be anything from rough plasticine sketches to elaborate scale models. In the case of the Chandara maquette, the domes are surfaced with acrylic modeling paste to smooth them out, and the smaller details such as gabled rooftops and railings are made from thin strips of mat board attached with a hot glue gun. The maquette is sitting on a 12-inch mirror panel to simulate the reflections on still water. These mirror squares can be purchased at any home improvement store. Why bother making physical maquettes? Why not use digital tools? There are plenty of 3D sculpting tools for planning virtual architecture, such as Blender, Maya, and Sketchup. But I prefer analog tools because I like literally wrapping my hands around the forms I’m going to paint. Although the digital tools offer convenient shortcuts for extremely complex forms or repeating shapes, for what I do, they aren't any faster than making actual models. More important, they can’t deliver on the sophisticated nuances of texture and interactive lighting that you get with real materials. The painting appears in the new Dover edition of Dinotopia: Journey To Chandara . The article appear in International Artist Magazine #118. Brilliant. Love the work. Have to get some sculpy and give it a go. I think you could have a very lucrative career as a PORTRAIT ARTIST, because the painting is much nicer looking than the model. Great reasons to make a physical reference model! The architect David Salmela made the poimt that a digital model is like having a photograph of ice cream in front of you; whereas a physical model is like tasting the real thing. I tend to forget that a "3d' computer model on a typical screen is still a 2d representation of a 3d object. Being able to physically hold reference material, turn it around in your hands, put it under whatever lighting you please... there's something special about it, isn't there? I've had people suggest I use 3D models, and I admit it does sound handy, especially for architectural maquettes, which I have yet to try constructing myself. But I know I get a lot out of building something with my hands. I learn more about the form of the thing that way, I think... I don't think I could replicate that knowledge by sculpting with a mouse instead of my fingers. 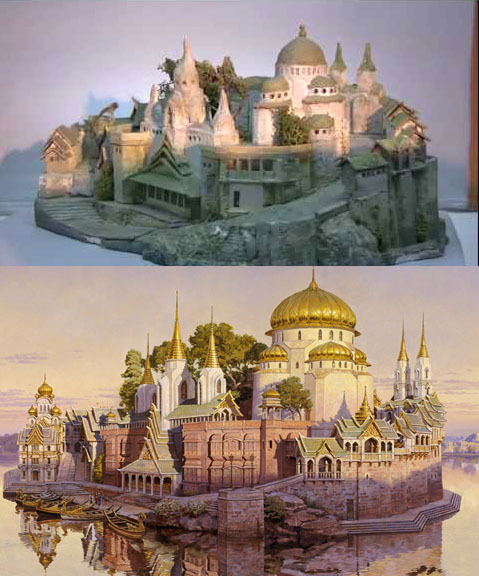 James Gurney, your paintings are really great, but your sculptures are as well. An idea is if you combine them both in a computer, where you have painted and sculptural elements in the same picture. It could be combined digitally on the computer, but everything actually seen would be still be an analog handmade artwork by you. Just an idea in case you might find it interesting. Take care.